I admit, I am not a huge fan of breakfast. It is literally a mood thing, especially on weekdays. I have a hard enough time waking up at o’ dark-thirty and getting myself into gear to go to work – it almost seems that my digestive system sleeps a couple of hours later. By the time my stomach is awake enough to consider breakfast, I usually defer to lunch. But there are times, especially on a lazy weekend, that I really enjoy a breakfast/brunch throw down. Especially if my stomach and I were able to sleep late. Breakfast (or brunch) is also more fun, to me, if there is a social element (and brunch is more fun if there are bottomless mimosas involved, but that is another story). My mother was a huge fan of breakfast, and I have fond memories of taking her to huge breakfast buffets. She would skip a fancy home-cooked meal, or a gourmet dinner out, in favor of breakfast. There was an awesome restaurant in Austin in the nineties that served down-home Southern cooking, with someTex-Mex thrown in for good measure. They served a mean chicken fried steak and cream gravy - and that same gravy pulled double duty for breakfast, ladled over fluffy biscuits made from scratch. 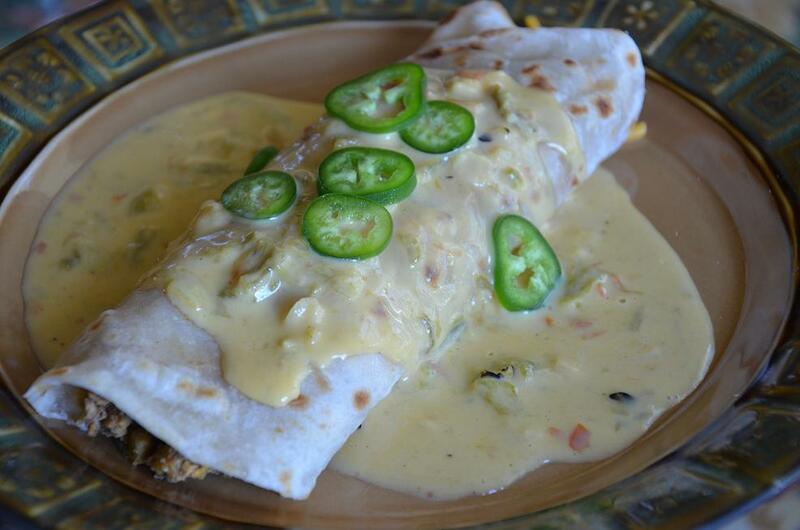 They also had a seriously tasty Tex-Mex breakfast diversion, a chorizo burrito, smothered in chili con queso. It was… amazing. The restaurant has since gone the way of the dinosaur, but this dish lives on as one of my all-time favorite breakfasts. First, I must clarify that the chorizo I am referring to is the Mexican breakfast sausage variety. Some of my Texan friends will ask, “is there any other kind?”. 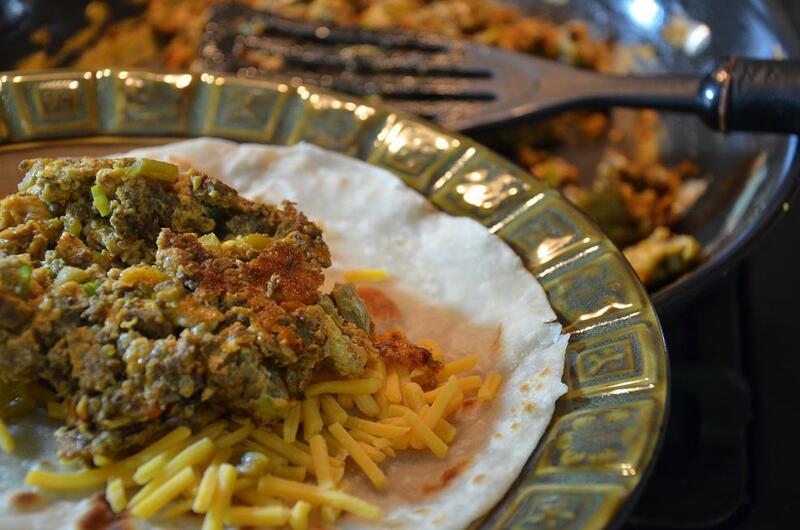 For those of us who love steaming chorizo and eggs snuggled in warm, fresh tortillas, you know what I am talking about. Mexican chorizo has a unique flavor, pork tinged with chilis, vinegar, and a complex blend of spices. Spanish chorizo, on the other hand, is a cured link sausage that can be sliced. It is quite flavorful as well, bursting with garlic, paprika, oregano, but would not work well in this dish. 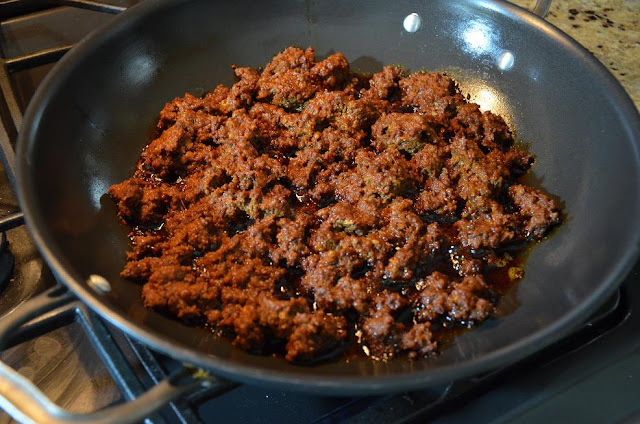 Brown chorizo in a large skilled on medium-high heat, stirring frequently. 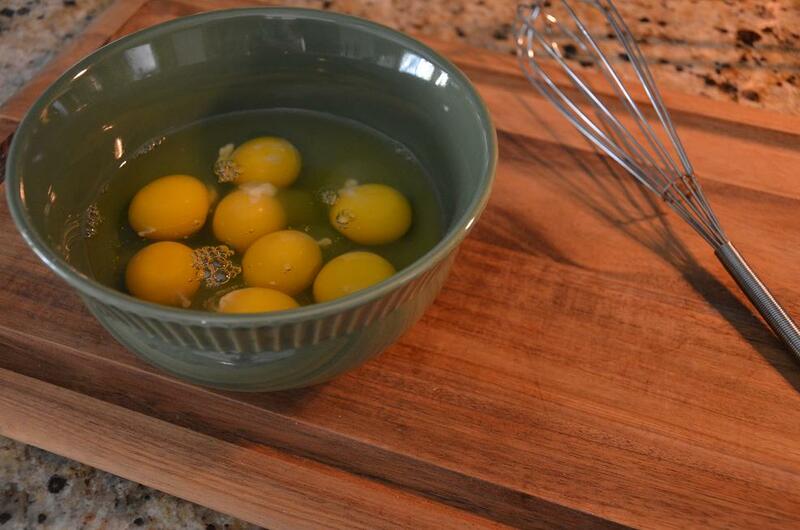 Crack 8 eggs into a medium mixing bowl. 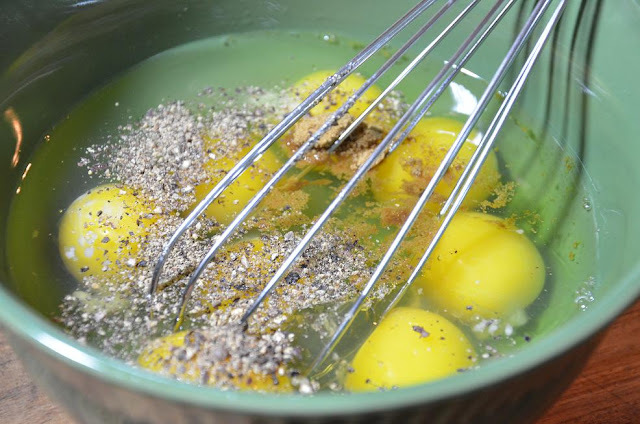 Add cumin, salt, cracked black pepper; whisk. 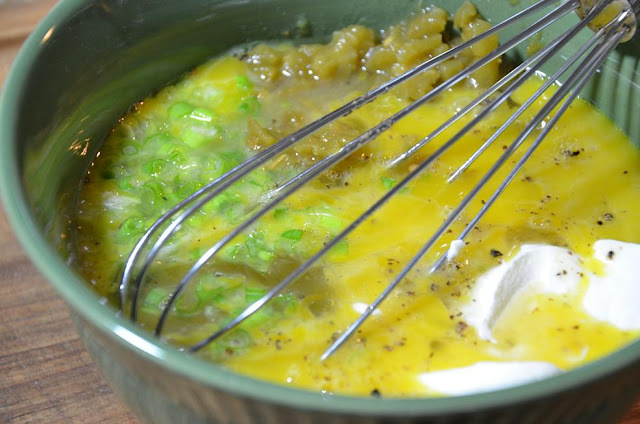 Add green chilis, green onions, and sour cream, whisk until blended. When chorizo is done, leave it in the pan, but blot excess grease with paper towels. Reheat pan to medium-high. Add egg mixture to hot skillet. When it begins to curl around the edges, fold and stir gently. 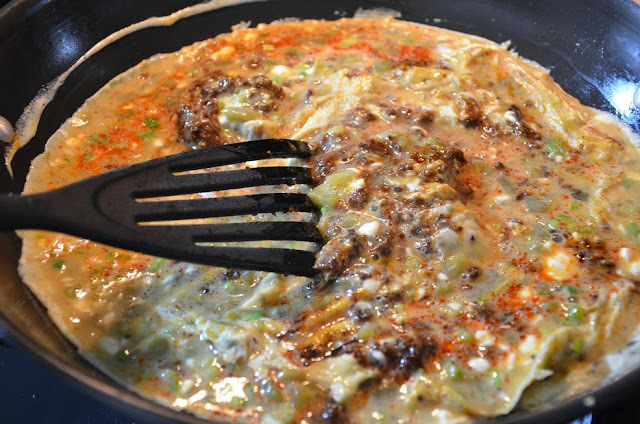 Continue to fold until the eggs are almost cooked through. Turn off heat. Continue to turn; eggs will finish themselves, “coasting” from the heat that remains in the pan. Cover pan and set aside. 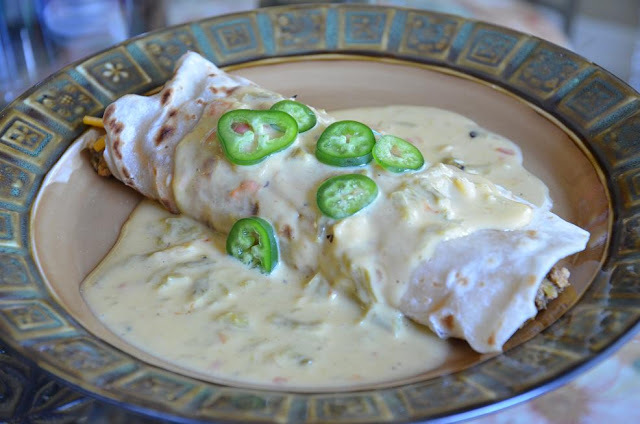 Heat the chili con queso, either in microwave or on stovetop. Make sure your tortillas are pliable – pop them in the microwave for 20 seconds or so to ensure this, or into a hot non-stick skillet. If not, they will break when you try to roll them. Take one tortilla on a plate and sprinkle it with shredded cheese. 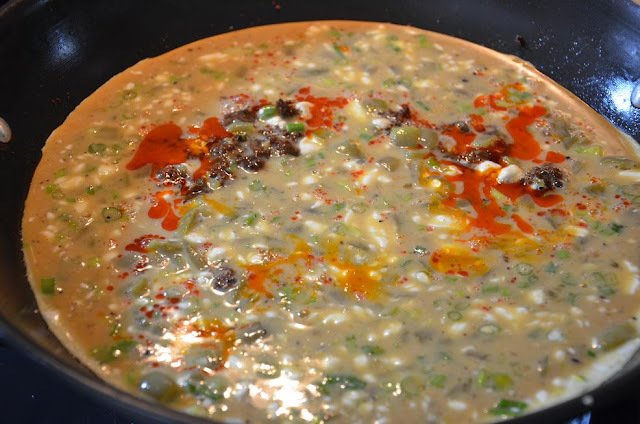 Top with ¼ of the egg mixture. Roll the ends together and roll the seam to the underside of the burrito (depending on the size of the tortilla, the ends may not overlap by much)! 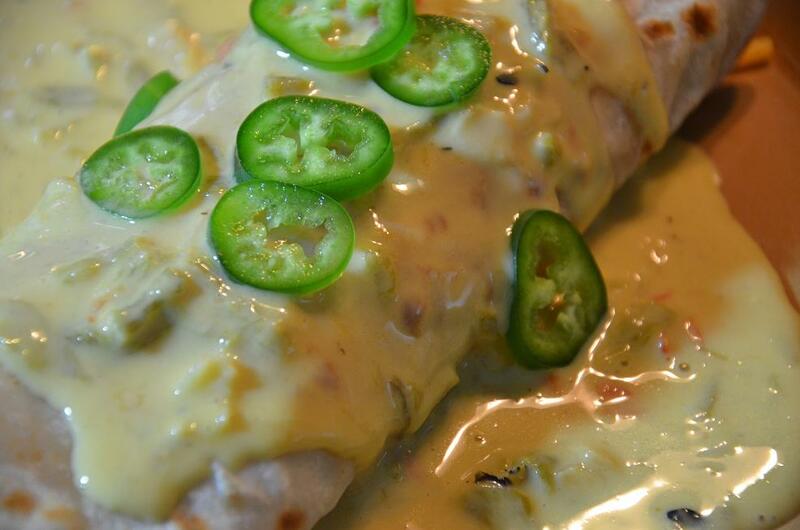 Ladle chili con queso over the burrito, and garnish with fresh jalapeno slices.